Paint top and bottom of box Ivory White. Cut 2”, 1 ½”, and 1” circles of solid and printed papers. Decoupage circles to bottom of box. Put icing border sticker around lid as shown. Cut light color paper to fit top of box. 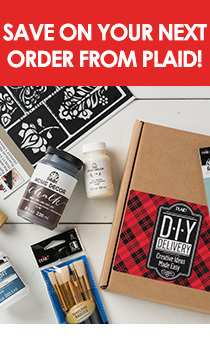 Apply paper to top of box with Sparkle Mod Podge. When dry, apply a second coat. Tie a bow and hang a small Christmas ornament at the top. Refer to photo for placement. Paint top and bottom of boxes Ivory White. When dry, apply a second coat if necessary. Paint box with one coat of Sparkle Mod Podge. Cut paper strips 1 3/8” and 1” as shown. One dark and one light. Decoupage around the bottom of the box leaving ½” between stripes. When dry, apply 1 coat of Sparkle Mod Podge. Cut an oval from dark paper and glue to top of lid. Apply icing border sticker around lid. Apply 1 coat of Sparkle Mod Podge.